The Soluxio solar street light enables light anywhere you desire. An outstanding choice if you are in need of a high-end reliable solar-powered light that can be installed anywhere you want. The Soluxio solar lighting product line offers high-tech, stand-alone solar-powered lighting communication, smart-city and electric-power columns that charge themselves through their unique cylindrical solar panels. With an efficiency of more than 23%, the incorporated solar cells are the most efficient and best working ones available on the market. Even in case of cloudy weather, low yield or indirect sunlight, the light post generates the desired amount of energy. FlexSol Solutions is the first in the market that integrates high-end lithium batteries, smart machine learning algorithms, advanced communication and outstanding solar technology into the future proof solar-powered solutions. This results in solar products that are reliable, durable, built to last and the perfect building block for smart-cities. Various configurations of the Soluxio solar light pole are available, with prices starting at 2399 euros. The Soluxio photovoltaic light pole is the perfect solution for off-grid locations, at locations where no other lighting infrastructure is available, or at locations where replacement is due. Off-grid means there is no need for cabling or grid connection, which makes the Soluxio solar light pole truly convenient. No trenching has many benefits as it will not cause disturbance to the neighborhood when installing the Soluxio solar light post. Moreover, the soil stays intact as there is no need for cabling. Benefits also include a quicker installation, no electricity bills and grid independency. The Soluxio solar light pole can also be installed as on-grid or as a hybrid light pole. FlexSol knows from experience that each projects will have specific needs.The exclusive Soluxio photovoltaic light pole is a state-of-the-art total solution and a building block for smart-city lighting. Its design allows you to adjust the solar light post according to your specific application. Soluxio is available in a range of standard heights (4, 5, 6, and 8 meters), but can also be customized to your demands at larger quantities due to the modular design. Likewise, mast material, color, finish and luminaire types can be adjusted according to your needs. Together, we can find a suitable configuration that will suit the needs of your project. The Soluxio solar light post is a smart and sustainable lamppost due to the use of efficient LED lighting and dynamic dimming schemes. Soluxio PV streetlights will automatically turn on at sunset and turn off at sunrise. With the smart lighting schemes, the Soluxio solar lamp is able to adapt, for example to the weather circumstances. Smart control and a highly efficient system guaranteed! The smart solar streetlight control system enables full control and monitoring over your solar light poles, making it a perfect building block for smart-city applications. Not only will you be able to have insights in the performance data of your Soluxio solar light posts, you are also able to access and control the installations through the online platform from anywhere in the world. Convenient and efficient, since you waste no time in physically checking if the Soluxio lamp post is working. Streetlight monitoring and building Smart-cities has never been so easy. FlexSol works exclusively with high-end lithium batteries. There are many reasons why FlexSol chooses to work with lithium batteries instead of lead batteries. To begin, lithium has proven to be a highly reliable battery technology with a much better Return of Investment (ROI). Moreover, lithium batteries can tolerate high temperatures , while lead batteries will decrease in quality and performance in hot and cold climates. Since high temperatures reduce the service life of batteries, lithium batteries are more beneficial compared to for example lead batteries in this case. The Soluxio solar lamp is available with two standard luminaires. However, it is also possible to add your own desired luminaire model to the Soluxio solar poles! Due to the use of high-quality materials, maintenance is kept to a minimum. The Soluxio solar light pole does not need heavy maintenance as its design and the used materials are of excellent quality. Soluxio solar lamp installations in the desert is an outstanding example of this. No scratches were found on the Soluxio solar light poles after years of installation, surviving several sand and dust storms. To add, due to the smart management platform, you will have access to clear insights in the performance of the solar light pole. Sustainability is something FlexSol Solutions highly values. In the process of designing, making, and delivering our products we consider to be environmental friendly as our priority is to create a better future with our solar lighting solutions. During the entire operational lifetime of the Soluxio solar light mast zero emission is produced. The high-class Soluxio solar street light is part of the Internet of Things (IoT) and a building block for Smart-Cities. Advanced Global Navigation Satellite System (like GPS, Gallileo and Glonass) and wireless remote communication is integrated as a standard feature of the solar light pole. 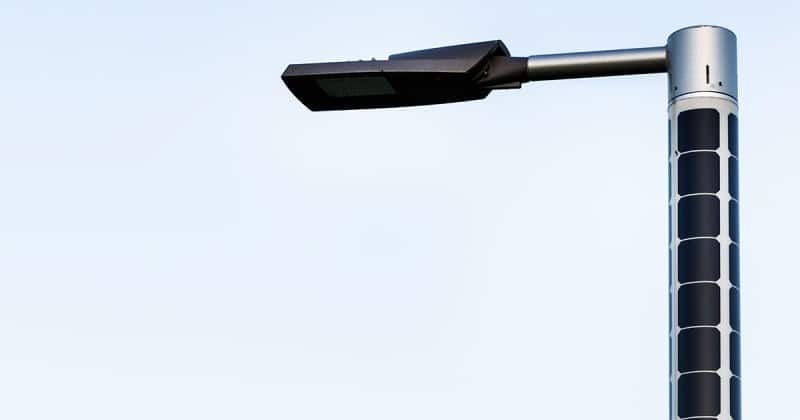 Optional features like a weather station, particle sensors, dataloggers or motion sensor truly make the Soluxio solar street light smart and future proof. The high-end pole can also serve as a solar powered antenna, solar powered datalogger or radio tower for remote areas or mobile applications. All applications can easily be installed through the hatch on ground level. With a future consisting of smart cities, the smart and energy neutral solar light pole offers the perfect solution to this area of opportunity. The Soluxio solar street light is the top-notch solution to reduce your energy consumption and work on a smart and sustainable future. The excellent Soluxio solar light post is highly suitable for enterprise solutions. You may think of solutions in the governmental, educational, and security sector. For more information, please visit: Soluxio solar lighting or take a look at the Soluxio product catalogue. Are you more interested in luxurious solar outdoor light that is more suitable for your private use (garden, driveway, court or other private/semi-public spaces)? Then, please visit the NxT solar outdoor light here.